Yolen, Jane and Adam Stemple. 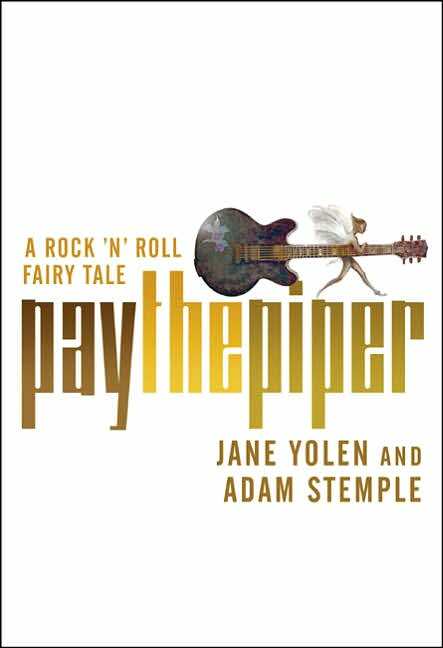 Pay the Piper: A Rock n’ Roll Fairy Tale. New York: Starscape, 2005. Print. Summary: Callie, 14, wants to go to a rock concert but her mega-protective parents won’t let her go. As the editor of the school news paper, Callie cooks up a quick scheme to interview the band, thus scoring backstage passes and forcing her parents to let her go cuz…it’s totally for school, right? Turns out the band is really a cadre of banished fairy folk who must make enough money every year to pay the king of the fairies, or else he must be paid in blood (read: human children). When money falls short, Callie’s little brother winds up on the blood list, jump starting Callie’s heroic and defiant side! Critique: I lovedLOVEDl.o.v.e.d the title of this book! A rock n’ roll fairy tale? Yes, please! Publishers ought to be pushing these out like apples: one a day, to keep the doctor away. I also loved that the premise of the book unfurled from a historical hypothetical: what if what happened to the children of Hamelin in 1284 was true? What if a piper showed up and actually (millennials read: literally) led all the children away to who know where? According to Yolen and Stemple, that event DID happen and it was because Peter Gringras and his Brass Rat band mates could not make enough money on their musical gigs to pay the king (also Gringras’s father who banished Peter–the piper, or virtuoso flutist–for accidentally killing his brother and heir to the throne). In practice, the worldbuilding did not fully support the dilemma, which let all the air out of the stakes. Nothing really felt urgent. Peter’s band has been around forever. They are fairies after all, and age super-slow compared to humans. So every good while, when their fans begin to wonder why they don’t ever look older, they disappear and reinvent themselves. New name, new place, new tunes, etc. But by Callie’s time, they are mega-famous. As a result, I was not sure why losing the money from one gig was enough to blow the whole year and send the kiddo’s packing to fairy-folk-land. Lastly, even though the point of view occasionally alternated between Callie and Peter, the story picked Callie as its protagonist. This also left me puzzled. In the grand scheme of things, Callie’s troubles were not that big. Her need for growth was, correspondingly, not that big. Peter, on the other hand, was a huge mess and had the most to overcome. On the bright side, this is one of the few fairy books where the girl protagonist is NOT enchanted and idiotically, helplessly, submissively in love with the hot fairy dude. Callie tells Peter straight up, You’re 800+ years old. I’m 14. Gross! As a result, Callie is permitted throughout the story to be smart, resourceful, and autonomous. She thinks. She decides. She acts. And that’s a refreshing change within this popular trope!